A Time Traveller’s Guide to Southwest Germany. I’m no history buff. 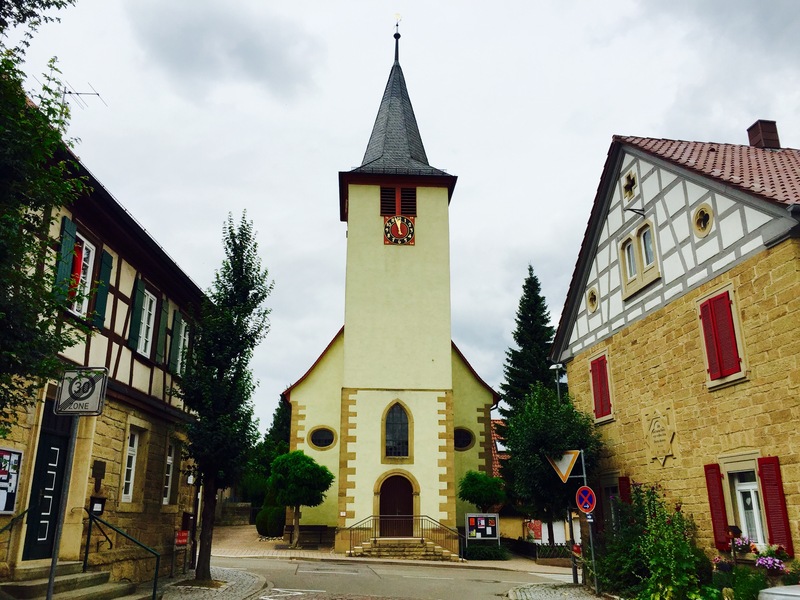 But traveling through medieval German villages dotted with timber-framed houses and vineyards dating back 300 years, felt like flipping through the pages of an ancient storybook. One minute, I was walking through the Gothic corridors of a monastery, where monks amusingly hid meat from God in the fasting season by stuffing it in ravioli. Another minute, I was intoxicated at a community bake-house where fire is still lit with wood from wine bushes, so the freshly baked bread has the fragrant aroma of wine (Read: Incredible Ways to Experience the World of German Wines)! 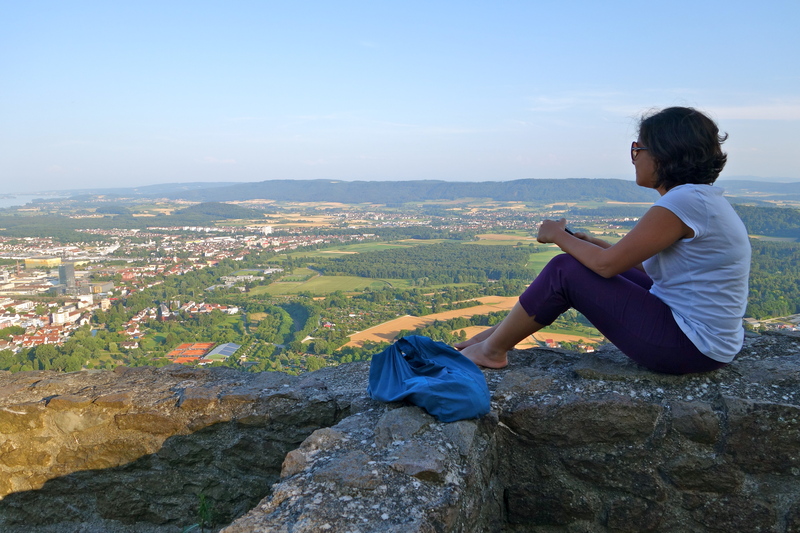 Soaking in the views from Hohentwiel Fortress. Hohentwiel Fortress; 1 hour. 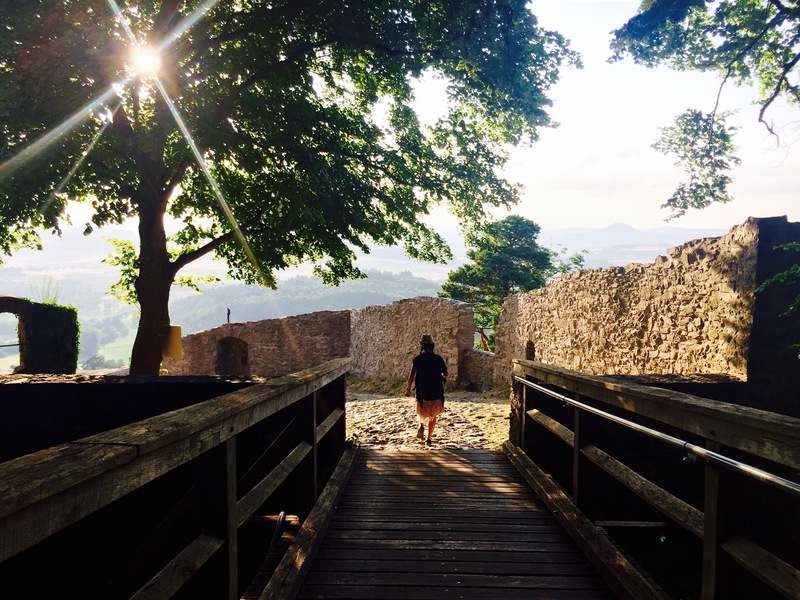 The stunning ruins of this 10th century castle atop an extinct volcano, in the backdrop of panoramic Alpine views on a clear day, are reason enough to hike up. But if you find yourself close to the German-Swiss border on a summer weekend, revel in the wine and music of an outdoor festival in this unlikely venue. The cellar of this castle stored 190,000 litres of wine in its heyday and locals were afraid that if they didn’t drink it, they would drown in it. So they started using wine for cooking! Pforzheim to Calw; 6 hours. The Black Forest was given its name for being a dark, dense, almost impenetrable forest. 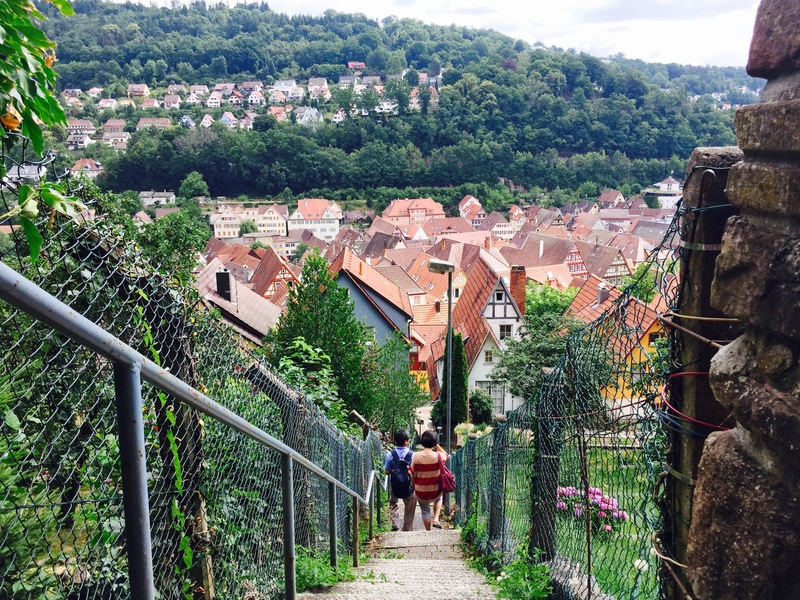 Unfortunately in the Middle Ages, it was heavily cut for timber, leaving walkable trails that the religious refugees followed (in reverse, from Calw to Pforzeheim). I was pressed for time, but I hear the 24 kilometers from the golden city of Pforzheim to the home of the famous German author Hermann Hesse in Calw, is an epic journey through the mysterious pine and fir forest, with colorful wildflowers, old churches and panoramic views of the surrounding valleys . You can even continue the journey all the way into Switzerland! Oberderdingen Vinothek. Wander along the vineyards of Oberderdingen (an hour from Stuttgart), planted as early as 1227! The village itself was built in the Middle Ages by the Waldensians; their traditional pyramid-shaped homes still have underground cellars on the outside to store wine. Drop by the village vinothek, once a sheep barn, for a fine glass of wine and fascinating conversations. Swabian ravioli. Legend has it that Cisterian monks tried to hide meat from God during fasting months by stuffing it in ravioli! Look for its German name maultaschen in any local resto in the region; the vegetarian version comes with spinach and cheese. Homemade German cakes and coffee. 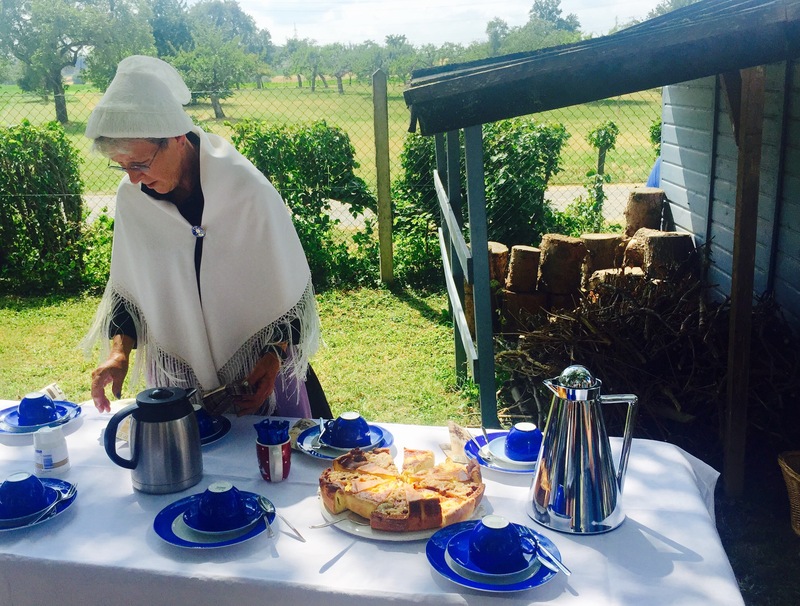 On many a lazy afternoon, we found ourselves in the sunny garden of a friendly local, savoring homemade apple/berry cakes and coffee – a German tradition I’ve come to love. Try chatting up a local on the countryside for a first-hand experience, or visit the German bakery in the village of Pinache. Bread with the aroma of wine! Back in the day, when the Waldensians built their houses with wood and mud, baking indoors was a fire hazard. So they creatively built communal bake-houses where fire was lit with wine bushes so that the bread carried the aroma of wine, and in villages like Grossvillars, the Waldensian descendants still gather once a month to continue this tradition. “Gasometer”; Rome in the Year 312. Before you call me crazy for seeing Rome in Germany, know that in an obscure industrial building in the golden city of Pforzheim, an Iranian-Austrian artist has recreated the most mind-blowing life-like 360 degree panorama of Rome in the year 312! I’ve seen nothing like it before. Calw; Gateway to the Black Forest. I was first introduced to Herman Hesse’s book, Siddhartha, by a German traveller I met in Ladakh. Then as fate would have it, I found myself in his picturesque hometown with cobblestoned streets, traditional architecture and quaint cafes. Took the stairs up and voila! I was in the Black Forest of Germany. The Waldensian church of Grossvillars. Waldensian churches. Walk through the old wooden doors of an intimate Waldensian church in villages like Grossvillars. If you listen closely, the walls will echo tragic stories of the times when weary souls built these churches, to safeguard religious beliefs they gave up their homes in France for. Maulbronn monastery. In contrast to the Waldensian churches, take in the extravagant Gothic-Romanesque architecture of the monastery around which the charming town of Maulbronn is built. The Cisterian monks made wine to keep warm in the harsh winter, and prayed for seven hours three times a day. Then the law of the land changed and turned them into religious refugees who found shelter in France! Would you like to time travel through Europe? This post is part of the Visit Europe blogging campaign, created and managed by iambassador in partnership with the European Travel Commission. Opinions on this blog are always my own. Join my travel adventures live on Facebook, Twitter and Instagram. Nice post Shivya. I was planning a trip to Europe and now I think I should put Germany on my itinerary. How many days do you think are enough to do the things you’ve mentioned here? Brings back memories to me of my forays into Germany and surrounding countries spanning 20 years. I’ve heard some of those stories 🙂 Incredible that I’ve started discovering them only now, and someone else will find them a decade later. Always fascinating reading about places that are off the tourist trail. Also makes you realize how big the world is and how much there is to see and experience out there. Glad you found it fascinating, Chaitali! And its true, imagine how many little villages and the beautiful secrets they hide are strewn the world over. Beautiful pictures and informative post. I would be interested to read what do you do when you are not traveling ? Beautiful pictures and informative log. I would be interested in reading what do you do when not travelling? Previous PostAlila Diwa: A Little Bit of Goa and A Whole Lot of Luxury. Next PostIn Photos: Incredible Moments in South Africa.